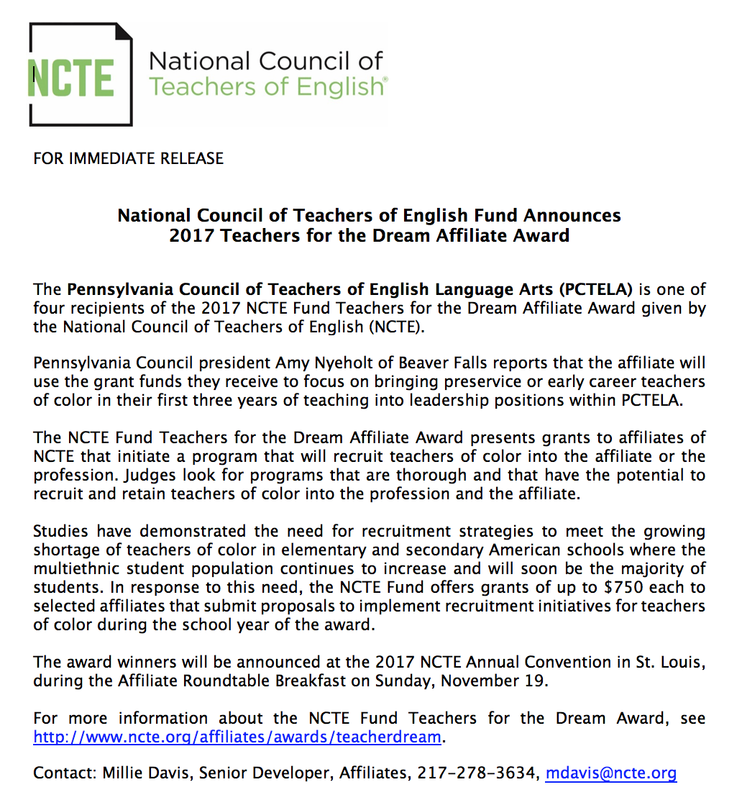 The Fund Teachers for the Dream grant was again awarded to the Pennsylvania Council of Teachers of English and Language Arts (PCTELA) by the National Council of Teachers of English (NCTE)! Just like last year, we are using this grant in order to mentor pre-service teaching candidates and new teachers within their first three years of teaching. Our goal is to select teachers of color who are enthusiastic, academically ­driven, and passionate about this profession! We want to support these teachers in developing and implementing a mentoring opportunity for students so they can grow professionally and share that flare for learning with students across Pennsylvania. We will be selecting two pre-service teaching candidates and/or new teachers within their first three years of teaching from Pennsylvania to mentor as they develop and enact an activity for students in a “pay it forward” play on professional development. See the full details and timeline for more information! If you’re interested in applying for this fantastic opportunity, please don’t delay! Applications are due by Friday October 20, 2017. You do not need to be an English or Reading teacher to submit a proposal! We welcome all teachers with a heart for using literacy in the classroom (reading, writing, speaking, and listening standards) at any grade level!